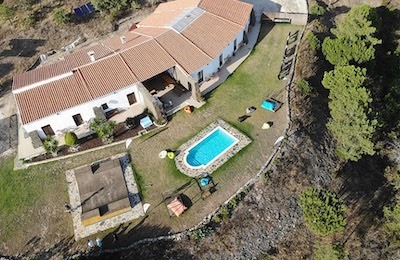 Just 10 min north of Carrapateira and a 30 min drive from Sagres and Lagos, this Surfcamp in Algarve consists of a nice country house in the middle of the wild scenery of the Alentejo Natural Park. 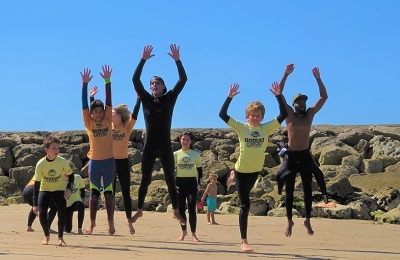 The surf camp is next to Vale Figueira’s beach, one of the best beach breaks of Portugal! A Family friendly Surf Camp great for a solo traveler or couples looking for a more comfortable Surfing holiday in a clean and private or shared accommodation, where the staff will assist you with helpfulness and friendliness, a Bar, swimming pool and skate ramp to have fun and meet people. Capacity for 55 people. Special rates for school groups. We offer different kinds of packages (Surf school, Surf guiding, Kitesurf, Yoga, Horseback riding or simply bed and breakfast). 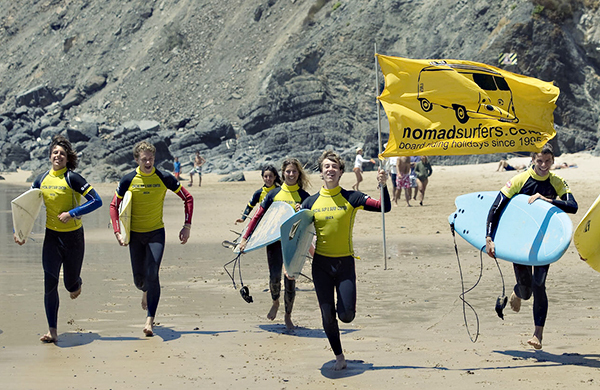 Our guests range from total beginners to experienced surfers. The Surf Guides and Surf Instructors will drive you in minivans and 4x4s in search for the beach with the best conditions of the day. Non-surfers also welcome! With no condos or hotels in sight and very few houses here, the surf camp is only a 5-minute drive from the beach of Vale Figueiras, one of the best beach breaks of Portugal! The surfcamp has satellite TV, thousands of movies and surf videos, PlayStation, Free WIFI internet access, snooker and wood stoves which make it very cozy on cool winter nights. Bicycles are available to discover the area. A quiet and private accommodation in a Modern Portuguese Country house with Swimming pool perfect for families and couples with 9 gorgeous double rooms with private bathrooms, and private balconies with beautiful views of the hills. Buffet Breakfast with delicious bread, croissants, different kinds of hams, salamis, sausages, bacon, eggs, salads, healthy cereals and mueslis, cheeses, fruit, nuts, natural juices, yogurt, toasts, jams, coffee. After the Buffet Breakfast, each guest is given an individual lunch bag for the beach. 2 sandwiches, Fruit, water, juices, and snacks. The Surf camp has its own kitchen, Russo, the owner, and his mum are in charge of the delicious homemade grandmother style meal 3-course dinners. Entrees, soup, main course, beer, wine, and sangria. On the day of arrival, dinners are served for everyone that arrives before 7 pm. Monday dinner Every Monday we have a barbecue (this is included). The best combination of chicken and meats on the Grill soup, salads, chips, and pasta, special food for vegetarians. *Friday dinner Every Friday we have dinner at one of the best Restaurants in the area. This is not included but we have a special group discount, you will pay around 25 EUR per person. The best T-Bone steaks and fresh fish of the area. Sargo, Douradas or Robalos with steamed vegetables. Friendly and adventurous souls from Portugal, Spain, Australia, Brazil, Latvia, Russia and more. Animal-Friendly! Bring your dog, no problem! Summer from May until October, when the swells are smaller, the surf guides and surf teachers take you to the chosen beach of the day along the west coast, usually good beach breaks. Winter from October until May there is more options, more swell and surfaris involve more exploring, adventure and an entirely new dimension open up in the South Coast as well! Reef Break and secret spots… During spring, autumn, and winter season the surf guiding for beginners, intermediate and experienced surfers is very exciting and you will be able to explore many different beaches along the entire Southern Coast from Sagres to Lagos. If the west coast “maxes out”, there are beautiful beaches on the south coast breaking perfect glassy head-high waves. e.g. Most of these beaches you will not find without our surf guides. Before we start any exercise the instructor explains some theory in the sand to explain what the exercise will consist of. At the end of each lesson, there is some time for free surf to practice what you have learned. Exercises to get up on the board in and out of the water. Evaluation of each person to know which level he or she has and which points to work on. surf green waves going right. The coach will be video recording and will correct you with an analysis at the beach and also at the surf camp. Turn on the top (re-entry) Introduction to reefs Surfaris to secret spots. Longboards, Mini Malibus, Funboards, and Fish models, a huge selection of short boards available. If you don’t want the hassle of bringing along your surfboards, getting overcharged at check-in counters, carrying them halfway around the world, and still risking them being broken or even lost, we can offer you a brand new stock of epoxy surfboards to rent from us if booked in advance. We have a warm and friendly Yoga instructor, that teaches most of the foundations of Hatha yoga, but being naturally explorative person, she´s hospitable to other styles and ideas, that approach to her own mentality, that’s why you can notice influences of Iyengar´s and Anusara alignments and restorative yoga, based on classical methods of relaxation. Tonya´s classes include stretching and strengthening of the key muscles, breathing exercises and meditations, sun salutations, balances, relaxations and provide with basic knowledge of alignments and essentials principals of Yoga. In the middle of the wild scenery of the Alentejo Natural Park. The surf camp is next to Vale Figueira’s beach, one of the best beach breaks of Portugal! Sunny climate year round, Sagres’ coastline is a Peninsula that provides good surfing conditions year-round on any surf spot at a time, regardless of swell or wind conditions. Wave size and quality range from average to epic, with an assortment of reefs and beach breaks that covers the whole range of surfing skills, from beginners to experienced. We are on the way to Vale Figueiras Beach. 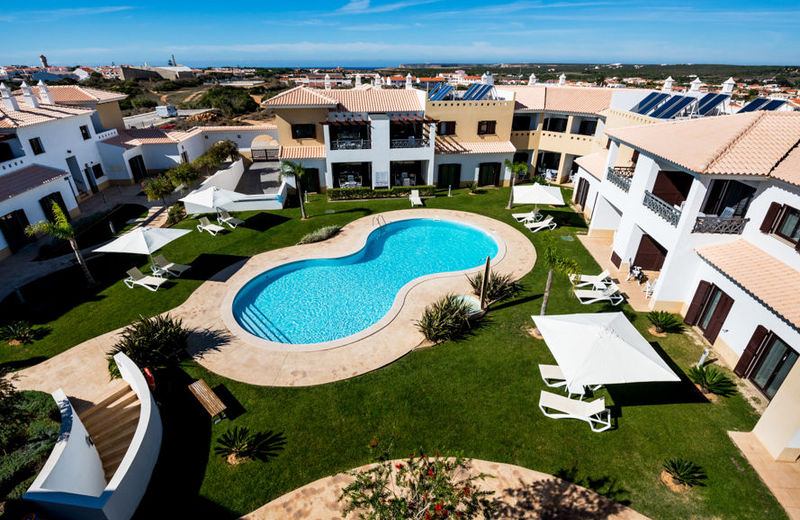 If you book we will send you the exact directions on how to get to the Nomad Algarve Surfcamp plus the GPS coordinates. We provide transfers from the closest towns Aljezur, Lagos and Bus Stop “Monte Novo, Vale Figueiras, Cha Bouco”. If you need a transfer, please CONTACT US IN ADVANCE. Pick up and drop off in Aljezur, Lagos are included for our clients who booked a Package or stayed with us more than 4 nights. By bus: We provide with FREE Transfers to/from the local Bus Stop “Monte Novo, Vale Figueiras, Cha Bouco”. The bus stop is on the way Lagos – Aljezur. You can take an EVA-bus from Lagos direction to Aljezur, or from Aljezur direction to Lagos, specifying the Bus Stop: “Monte Novo, Vale Figueiras, Cha Bouco”. Timetable can be checked via www.eva-bus.com: Monday to Friday usual schedule: 08:45, 12:35, 13:45, 16:40, 18:20, 19:15 (from Lagos). Saturday: 13:45. Transfers to Lagos and Aljezur with our car/van: 40€ per person/per way. Transfers to FARO airport transfers: 125€ per car/per way (max 4 pax). Transfer to LISBON airport transfers: around 260€ per car/per way (max 4 pax). Big Bus can be organized for groups by request. In low season you can do less than one week and you can also start any day of the week. 3 and 5-day packages are also available.